The Appalachian travel scene got an early push from natural hot springs, but it was cool summer weather that really drew the well-to-do to the highlands. Hotels from North Carolina to New England promised lower temperatures and relief from hay fever and asthma, and none was higher or cooler than the Cloudland Hotel, perched at almost 6,400 feet atop Roan Mountain in northernmost Mitchell County. 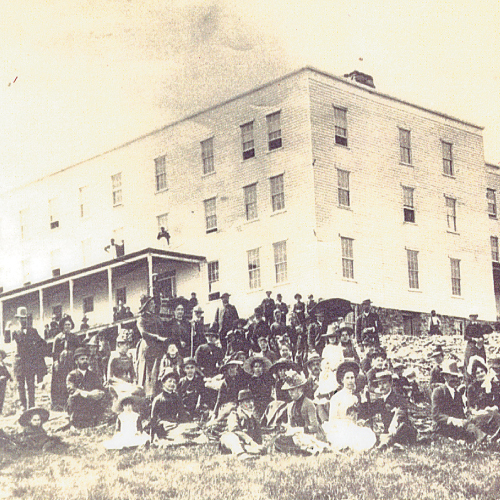 The hotel, which had a modest opening in 1877, qualified as an early experiment in ecotourism. “The Roan” had been justifiably famous among early botanical explorers like André Michaux, Asa Gray, and, by the late 1890s, even John Muir. That elite clientele made visiting Roan—which Gray called “the most beautiful mountain east of the Rockies”—a rite of passage for naturalists. The entrepreneur behind the hotel was John Thomas Wilder, a U.S. Army brigadier general in the Civil War and industrialist. Borrowing the name locals used to describe Roan’s foggy top—Cloudland—Wilder touted the New England-like appeal of the mountain climate. Among his noted northern guests was Charles Dudley Warner, coauthor of the novel The Gilded Age with Mark Twain, who visited Roan in the early 1880s. Warner arrived when a stay at Wilder’s hotel, then a 20-room lodge of spruce logs, was “a lot like camping,” he wrote in the Atlantic Monthly. But he was pleased to find the civilizing influence of women amidst such crude circumstances, and took day hikes and soaked up the scenery. The success of that convivial society on the summit led Wilder, in 1885, to replace the meager lodge with a 166-room white-clapboard hotel (which featured only one bathroom). The new iteration of Cloudland groaned in the mountain’s prodigious winds and winter but furnished a cool paradise for summer and fall visitors. Interestingly, the North Carolina/Tennessee border bisected the building, marked by a stripe on the massive dining room floor and table. For a time, spirits were permitted in Tennessee and proscribed in North Carolina, so drinkers had to stick on the Tennessee side of the room—and a sheriff made sure of it, according to local lore. Guests played golf and croquet on the grassy balds, and there were comfy spring beds, steam heat, and plentiful fresh food. Locals bolstered their livelihoods by shuttling supplies, cleaning the hotel, and cooking for the visitors from afar. Still, maintenance was a perennial problem on this weather-blasted summit, and in time, Wilder lost interest in Cloudland. Managers came and went, and service suffered. Circa 1915, the hotel closed, and today, outside of historical displays, only stray relics and traces of the old carriage road remain as a testament to its storied run.